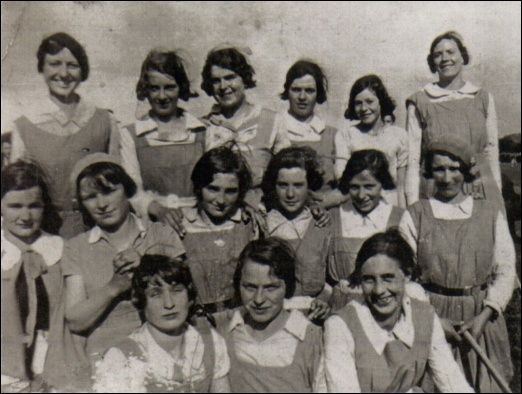 Maggie Murphy, Myshall; Kathleen Murphy, Myshall; May Murphy, Myshall; Bridget Murphy (Mrs. Dunne Myshall); Molly Fox, Shangarry; Katie Fox Shangarry; Kathy O’ Neill; Maggie O’ Neill Shangarry; Margaret Bennet, Ballaghmore; Mary and Annie McDonald Moneygrath; Julia Cleary Ballinacrea who played in goal, Agnes Keogh Coolasheegaun; Mai Keogh Aclare. This team only lasted a short time and they joined the “Blues” or gave up playing altogether. Misses Marie Clancy (Captain), Marie O’ Rourke, M. Clowry, A. O’Shaughnessy, L. O’Shaughnessy, M. Bolger, A. O’ Donohoe, M. O’ Donohoe, B. Kavanagh, M. Nolan, M. Fenlon, J. Keating, B. Murphy, Mrs. Brown and Mrs. Nolan. The girls playing at the time from the parish whether with Garryhill Rovers, Shean (again information is scant), Myshall Blues, or Drumphea Independents were reported to be doing their bit towards the promotion of Gaelic games and their efforts were rewarded by the co-operation of the public. On one occasion Carlow played Shean and “every stroke was fought and every score hard-earned on both sides”. Carlow won in the end by a margin of one point – final score Carlow 5 goals, Sheen 4 goals and two points. One camogie tournament at Myshall saw “some very close and interesting matches” played with eight teams from different parts of the county attending to do battle for a beautiful set of silver medals. It appears a first class pitch, splendid weather and a fine sporting spirit in every game combined to make a most enjoyable evening’s sport. From the large number of spectators it was evident that camogie was gaining popularity and the newspaper continues “if the enthusiasm of the different teams on Sunday is any criterion in a short time we will have first class exponents of the game all over the county and imbued with the true Gaelic spirit the cailíní will do much to banish foreign games form our midst. We hope that the enthusiasm which prevails at present to foster the “Games of the Gael” will continue and that those who have undertaken the good work will not relax their efforts until camogie which is now in its infancy is firmly established”.